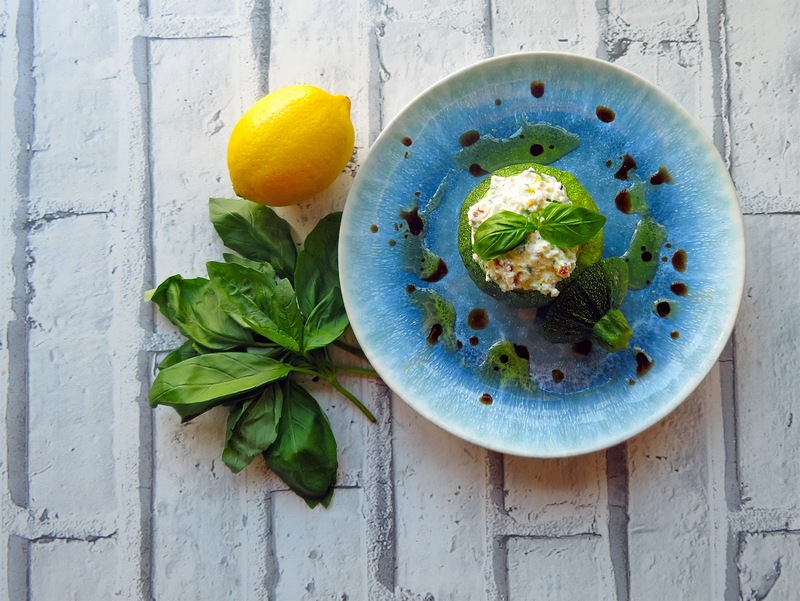 RECIPE : SUMMERY RICOTTA STUFFED COURGETTES - Sugar, Darling? Unsurprisingly during hot spells like this my food cravings always turn to Greek, Italian or Mediterranean dishes. These countries that enjoy far more sunshine than we do in little old England have such a talent for creating salads and other cold or room temperature dishes especially with the lush fruit and vegetable produce that their lands produce. 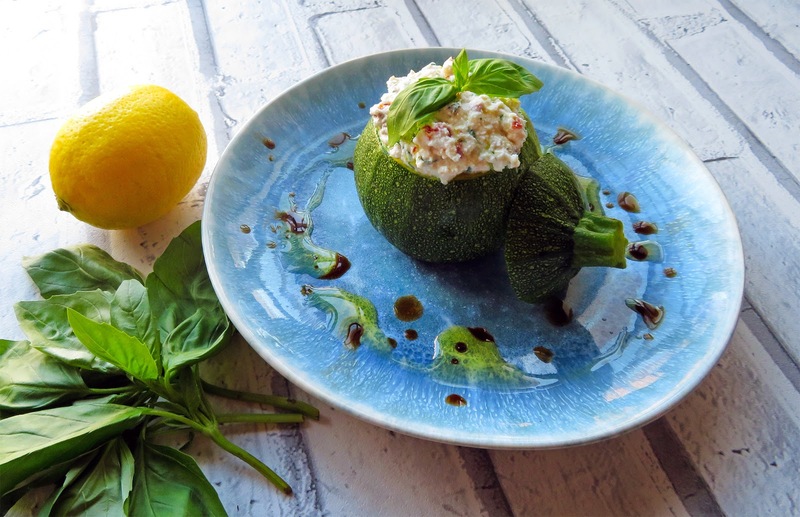 Although mainly influenced by Italian fare the premise of room temperature steamed courgettes was first introduced to me on a little Greek Island where I was served little baby courgettes that had been steamed and then sucked up extra flavour being marinated in olive oil and lemon juice while they cooled. Alongside warm flatbreads, freshly made hummus and other dips and joined by marinated octopus, grilled prawns and fried halloumi this was a real meal of the gods and I knew I wanted to try and recreate it at home. These courgette 'bombs' would make a great vegetarian main course served with various salads and some tasty bread but I dished them up as a starter ahead of grilled steak with herby butter, lemony potato wedges and bitter leaf salad. One thing I would recommend is only making this dish in the Summer when courgettes are in season. I got my round courgettes from Natoora at Ocado. Lightly wash the courgettes, chop off the stemmed tops like little hats and set them aside, then scoop out the interior of the round courgette to create a bowl for the filling. Steam the courgettes for about 5 minutes until tender but still firm and not mushy, then dry them and set them aside to cool to room temperature while you make the filling. Mix the ricotta, lemon zest, basil and sun dried tomatoes then season to taste with salt and pepper. When the courgettes have cooled to room temperature spoon in the filling - I like it to look generous and overflowing. Plate up the stuffed courgettes one per person and give them and the plate a drizzle of EVOO and balsamic vinegar before finishing with a basil leaf garnish if you're so inclined. I like to place a little jug of balsamic on the table to allow people to add more if they, like me, love the sweet tang of this magical condiment! MIX IT UP - You can vary this recipe greatly with just a few changes such as adding finely sliced chilli, roughly chopped capers or roasted red peppers or you could even swap the basil for dill and the tomatoes for smoked salmon slivers for a luxurious twist!